Axle replacement on a boat trailer repair in St Augustine Jacksonville Florida. 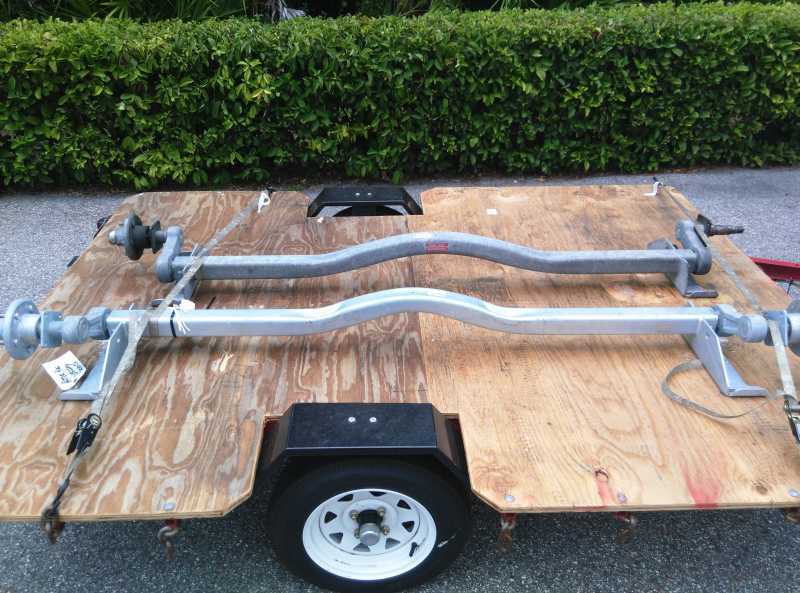 Axle replacement on a boat trailer repair in St Augustine and Jacksonville Florida. This boat trailer was was no longer towable. The wheel was on the verge of falling off. It had even rubbed the plastic fender and melted it's exterior. The grease cap was gone and grease had spewed all over the wheel and tire. Obviously the bearings were destroyed, but had they also ruined the spindle was the question at hand? The bearings were so destroyed, they were no longer holding the idler hub to the spindle. Now it's time to clean up the spindle and get a real look at it. The dents on the top didn't look good, but then the bottom looked much worse. This spindle will never hold a grease seal in place well enough to keep the grease in. Furthermore the spindle was so marred up bearing races would never sit flush again. This spindle was destroyed. Replacing it was the only option to get the trailer rolling again. However to replace the spindle meant replacing the entire axle as they were built to be inseparable. So off the junk axle comes and the hunt begins for a replacement torsion axle of the same exact dimensions. Here you can see the new torsion axle next to the old one, to be sure they are exactly alike. Our name is After Hours Welding & Trailer Repair, so you wouldn't be surprised if we are working after 5 pm would you? If you have a tight schedule, we aim to accommodate it while the other shops deliver you excuses why it takes so long to fix. I don't want to bad mouth the other shops, but hey, the fact I will work till 9pm any night of the week, needs mentioning somehow. We are fitting up the new torsion axle to the boat trailer frame. It needs to be in the same exact place the bad axle came from, so the trailer still steers down the road straight when being pulled/towed. ABOVE is the passenger side of the trailer. BELOW is the drivers side of the trailer. We are making sure the new axle aligns up with the marks we made as we removed the bad axle. All is well so we tighten it up. Remember that tire that had the bearing grease spewed all over it? Now it's time to clean that up and make it look new again. It had to be scrubbed seven times with degreaser to clean it up. The grease was so thick the 1st few scrubbings just seemed to be smearing it around. But with persistence and determination it cleaned up. ABOVE is before cleaning, and BELOW is after cleaning. ABOVE is after cleaning, and BELOW is how it looked when the tow truck dropped it off. St Augustine trailer axle repair near Jacksonville Fl. No matter what you're trailer repair needs are, I can get you fixed up and back on the road speedily. And the best part? I work for less and will save you money as compared to if you brought it to some other shop.